through 11 AM Friday, January 18th. South Pass Snotel...                 6 inches. Deer Park Snotel...                  6 inches. Hobbs Park Snotel...                 6 inches. Burroughs Creek Snotel...            2 inches. Cold Springs Snotel...               1 inch. Townsend Creek Snotel...             1 inch. St. Lawrence Alt Snotel...           1 inch. Owl Creek Snotel...                  1 inch. Willow Creek Snotel...              15 inches. 3 SE Bedford...                     12 inches. Cottonwood Creek Snotel...          12 inches. 5 SSE Smoot...                      11 inches. Spring Creek Divide Snotel...       11 inches. Star Valley Ranch...                 9 inches. Indian Creek Snotel...               9 inches. 2 SE Thayne...                       8 inches. Blind Bull Summit Snotel...          7 inches. Salt River Summit Snotel...          7 inches. Blind Bull Summit...                 6 inches. Box Y Ranch...                       6 inches. Kelley Ranger Station Snotel...      6 inches. Hams Fork Snotel...                  5 inches. Reno Hill Snotel...                  5 inches. Casper Mountain Snotel...            5 inches. 4 WSW Casper...                      2 inches. Younts Peak Snotel...                4 inches. Evening Star Snotel...               1 inch. Beartooth Lake Snotel...             1 inch. Pocket Creek Snotel...               9 inches. Big Sandy Opening Snotel...          9 inches. Larsen Creek Snotel...               8 inches. Triple Peak Snotel...                7 inches. Snider Basin Snotel...               6 inches. Loomis Park Snotel...                5 inches. Gunsite Pass Snotel...               5 inches. Kendall Ranger Station Snotel...     5 inches. New Fork Lake Snotel...              5 inches. East Rim Divide Snotel...            4 inches. 14 NW Pinedale...                    4 inches. Daniel Fish Hatchery...              3 inches. Boulder Rearing Station...           3 inches. Elkhart Park G.S. Snotel...          3 inches. Green River...                  4 to 3 inches. Jackson Hole - Mid Mountain...      10 inches. Jackson Hole - Raymer...             9 inches. Phillips Bench Snotel...             9 inches. Jackson Hole - Rendezvous Bowl...    9 inches. 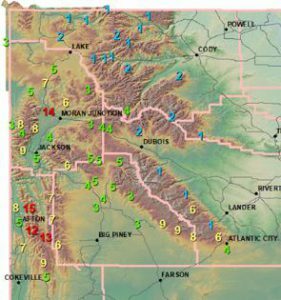 2 NE Teton Village...                8 inches. 6 NW Moose...                        8 inches. Grand Targhee Snotel...              8 inches. Grand Targhee - Chief Joseph...      7 inches. Snake River Stn Snotel...            6 inches. Granite Creek Snotel...              6 inches. Base Camp Snotel...                  6 inches. 3 SSW Wilson...                      6 inches. 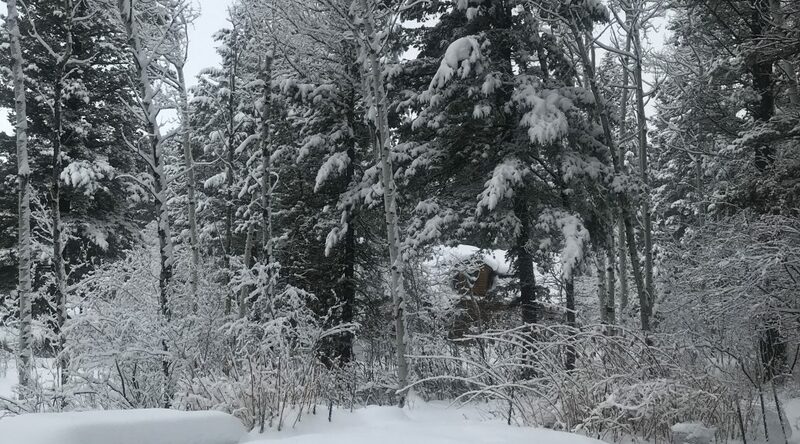 Jackson Hole - Base...               5 inches. 3 NNE Wilson...                      5 inches. Grassy Lake Snotel...                5 inches. Gros Ventre Summit Snotel...         5 inches. 12 NE Jackson...                     4 inches. Grand Targhee Ski Area...            4 inches. Togwotee Pass Snotel...              4 inches. Togwotee Mountain Lodge...           3 inches. 1 NNW Alta...                        3 inches. Lewis Lake Divide Snotel...          7 inches. Thumb Divide Snotel...               5 inches. Two Ocean Plateau Snotel...          3 inches. Parker Peak Snotel...                2 inches. Lamar Ranger Station...              1 inch. Tower Falls Ranger Station...        1 inch. Sylvan Lake Snotel...                1 inch.